We understand that sanitary equipment must demonstrate exceptional standards of hygiene and dependability. To ensure we can meet your specifications, we’ve partnered with prestigious manufacturers who produce the high-caliber, reliable equipment. 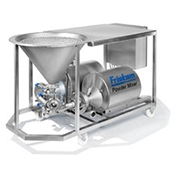 We are proud to be distributors for industry giants like Fristam pumps and Anderson instruments. Because we’ve worked with these companies for many years, we can offer excellent sales advice as well as exemplary post-sale services. In addition to offering all our customers premium sanitary equipment that’s suitable for a range of different systems, we also keep a full inventory of parts. If you have an existing displacement pump that needs a new component, just get in touch with our staff and we’ll do our best to find exactly what you’re looking for. Next-Day Delivery on our Dairy Fittings, Pumps, and More! As one of the leading positive displacement pump suppliers in the Midwest, we are proud of our reputation. We not only provide every client with exceptional products, but also dedicate, knowledgeable customer service. To find out more about our product offerings, place an order or call us at (800) 622-8425.